My newest video features the bizarre metal asteroid 16 Psyche. This improbable chunk of iron and nickel may one day be mined, yielding metals worth over 10000 quadrillion dollars! No, that figure doesn’t seem real to me either. Here is the transcript for said episode. I had some fun experimenting with effects for this episode, and I think it works well! Do you think you’re rough and tough? Do you believe you’re made of metal? See if you can outmetal THIS monster! A ball of metal mayhem 200 km across! Let’s go check out 16 Psyche!!! Long long ago, in a molecular cloud not so far away…. It is a time of turmoil in the newly formed solar system. Planets, moons and other heavenly bodies have coalesced from the primordial cloud. As larger bodies fall into orbit around a blazing new sun, smaller worlds are caught up in a system wide spree of destruction known as the Late Heavy Bombardment. 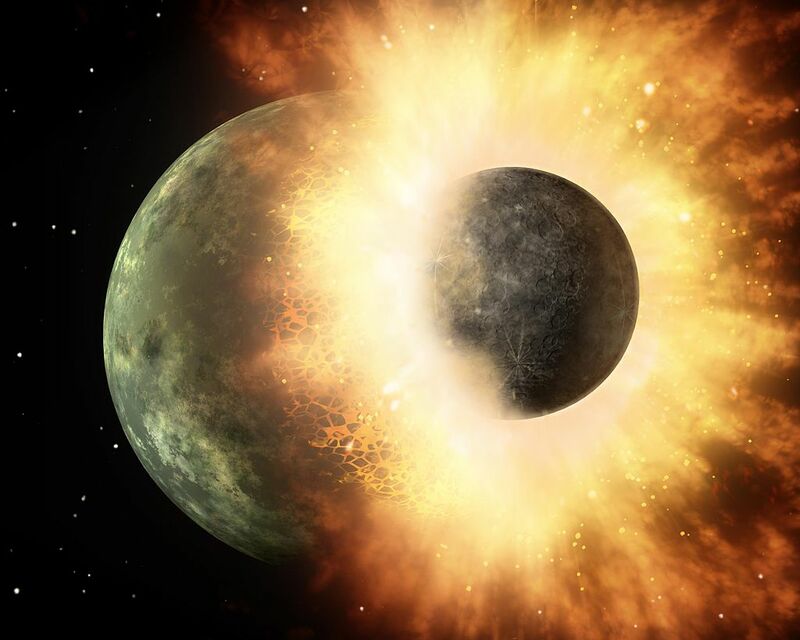 It is a perilous time for a planetesimal or moon, and many smaller planets are destroyed in the cataclysm. A lone youtuber known as Ben has ventured out into the Big Empty, to visit the long dead core of one such world. Upon reaching it, he sends in a gallant drone to investigate…. Yes Sir! Here we are. Welcome to 16 Psyche. An oddball world really. This place is special for a few reasons. Discovered in 1852 by the Italian astronomer Annibale de Gasparis, 16 Psyche was named after Psyche, a figure from ancient Greek mythology. The word itself means “Soul”. 16 Psyche is pretty big: a ball of metal over 200 km in diameter! It’s almost entirely nickel and iron to be more precise, although about 10 percent of its surface is strewn with silicate rock much as you’d find here on good old earth. So this ball of tinfoil from hell comprises nearly one per cent of the mass within the asteroid belt where it lives. It actually lies roughly halfway between Jupiter and Mars, about 3.3 AU from the sun. AU is a very common astronomical term. It means “astronomical unit’. 1 astronomical unit is defined as the distance between Earth and the Sun. This is about 93 million miles or 150 million kilometres. At 3.3 AU this means 16 Psyche lies some 308 million kilometres from the Sun. Wanna know what’s really special about this metal asteroid? First of all, 16 Psyche is extremely valuable. All of that iron and nickel within has been valued at over 10000 quadrillion dollars! Obviously that means a lot of folks would love to mine it for all that metal. A whole bunch of companies have sprung up in the last few years, looking to cash in on asteroids: the next big thing! Personally, I don’t care about all that. You wanna know what’s really cool about 16 Psyche? It’s the exposed core of a long dead protoplanet; the remains of a tiny world maybe 500 km in diameter. This tiny planetoid took a beating during the Late Heavy Bombardment, some 4 billion years ago. In fact, this nameless world may have been impacted by other large bodies up to 8 times. This pounding shattered the outer crust, sending scattered fragments out into the newly forming asteroid belt and leaving behind an exposed core. Scientists would love to study 16 Psyche, because it can teach us a lot about planet formation and how planets work- including our own. Just look at it! Imagine walking on the core of a planet. 16 Psyche gives us an opportunity to see into our own world in a way. It’s like a time capsule: a snapshot of a newly forming planet, frozen in time for ever. This is the real value of 16 Psyche, this frozen soul. Let’s take one last look and imagine actually being there…. I hope you’ve enjoyed watching this episode. It was super fun to make, and if you got something out of it, then subscribe to this channel for more. Join the astrobiological Facebook group, find me on Twitter. Links in the description.